Keeping cozy in style is our main goal this fall and winter, so the Shop With Us team is stocking up on a variety of sweaters, cardigans, light jackets and coats. Our latest find is this cocoon sweater and we can’t wait to wrap ourselves up in it all season long thanks to the many different colors it’s available in. The Leith Ribbed Shawl Cocoon Sweater has a stretchy, soft fabric blend that includes rayon, wool and cotton. It’s thick enough to keep Us warm, but is also thin enough to easily layer on top of other sweaters. The chic design is great for wearing with casual ensembles, throwing on top of dressier looks for work, or even wearing while simply lounging around the house in staycation mode. 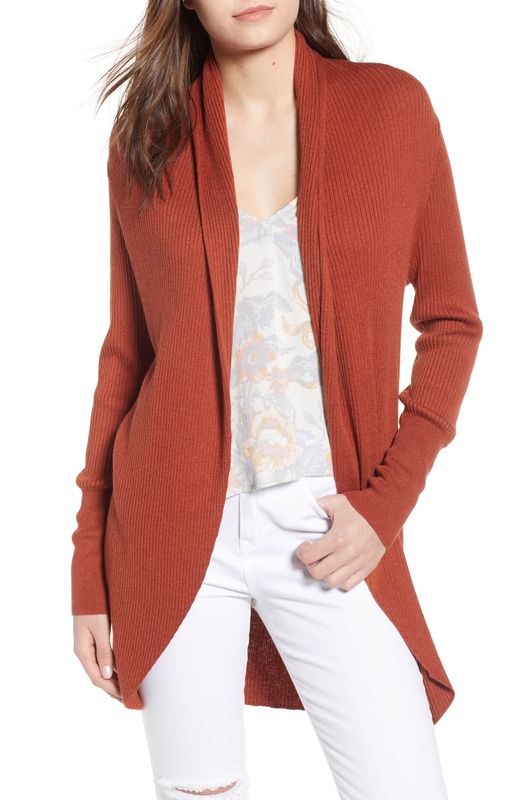 See it: Get the Leith Ribbed Shawl Cocoon Sweater for $69 while it’s still available in a variety of colors at Nordstrom. Since the sweater has an open front, it provides lots of room to play with peekaboo prints, textures and even scarves. Sizes range from XXS to XXL and are available based on color. Our favorite hue is this beautiful light Pink Adobe shade. We’ll be layering this pink shawl cocoon design over a white cropped sweater, skinny jeans, brown over-the-knee boots and capping the look off with a Marc Jacobs camera cross-body bag! For shoppers who are major pink lovers like Us, there is an additional Misty Pink option that is just a touch brighter. Another shade we adore is this rich Brown Spice (burnt orange) that is so appropriate for fall. Shoppers who own this topper repeatedly noted how comfortable the fabric feels and how easy it is to mix and match with the rest of their closet. 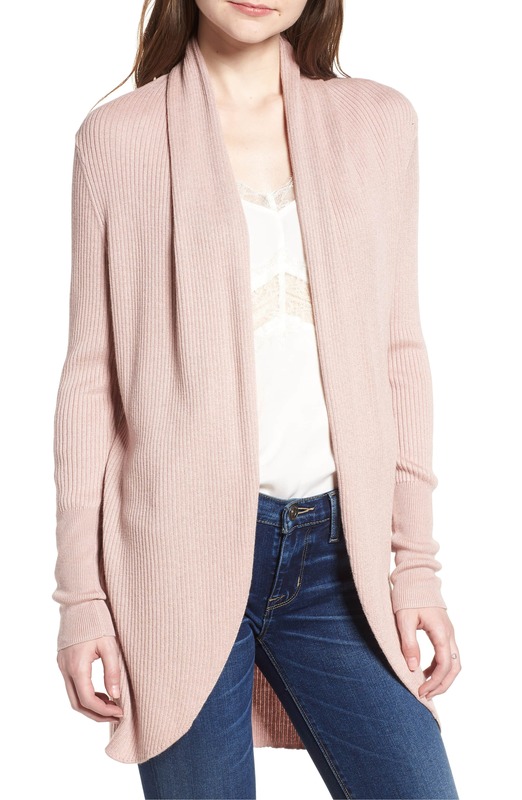 Lots of reviewers shared that they grabbed this cocoon sweater in multiple colors. Two of the most frequently mentioned colors purchased are the Brown Spice and grey. 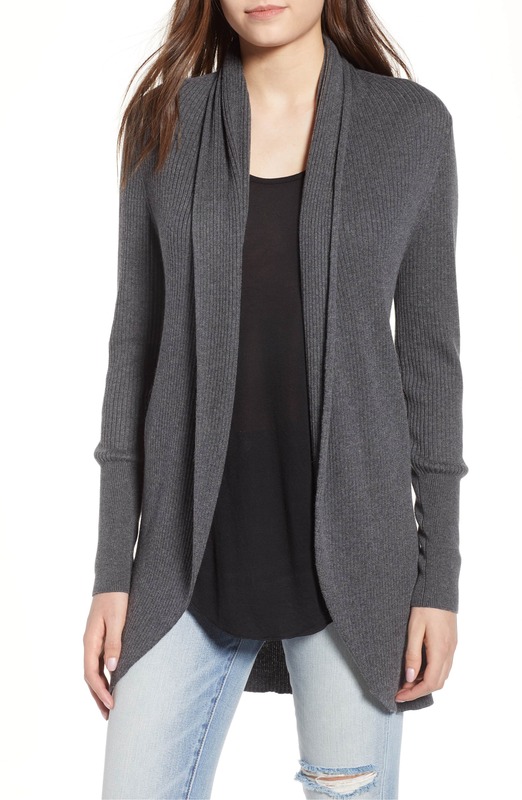 A number of reviewers also noted that the ribbed sweater runs large, so eyeing the size guide carefully and ordering one size down may be best.